Today, luck and Las Vegas. The University of Houston’s College of Engineering presents this series about the machines that make our civilization run, and the people whose ingenuity created them. Las Vegas is the very definition of audacious. Its buildings are too posh; its shows too extravagant; its signs too large and too bright — clouds of neon hovering over the desert. Love it or hate it, it’s uniquely Las Vegas. And it’s paid for with money from gambling. But it’s not really gambling. That’s because casinos understand the mathematics behind their games. And most players don’t. For the casinos, it’s a sure bet. It’s no secret that casinos have the games tilted in their favor, but it’s worth taking a look at the numbers. With one exception, every game favors the casinos. The house edge can be large or small, depending on the game. The house edge for roulette is a little more than five percent. That means that, on average, for every hundred dollars you wager, you’ll lose five. Doesn’t sound too bad. With a little luck, you just might win. But here’s the surprise. Math can tell us, with great certainty, how lucky we can expect to be. And things aren’t as good as they sound. Suppose I go to Las Vegas for a long weekend and play roulette for a total of twelve hours, wagering the same amount on each spin of the wheel. Then I have to face the following fact: there’s a ninety percent chance that I’ll come home a loser. If I play for a week, my chances of losing jump to well over ninety-nine percent. The story gets even worse if I play slot machines, where the house advantage is often over ten percent. A rare few will take home a jackpot. But everyone else will pay their dues to the casinos. Things get better if I play baccarat or a good basic game of blackjack, but the chances of walking away a loser are still remarkably large. Casino games are designed to let players feel they can win — that they can get lucky. But mathematics tells a different story. If you play for even a few days, you’re almost certain to lose. Today’s casinos know this. Gone are the days when pit bosses fretted over players on a “lucky” streak. If you’re playing, that’s all the casino needs to know. The numbers will all work out in the end. That’s why casino loyalty programs are based on time spent playing, not wins or losses. So is there any way to win at a casino? Yes. Playing poker. Casinos don’t care who wins. They make their money by charging a fee. Competitors must play skillfully enough to overcome the fee. But if they can, the math will work in their favor — just as surely as it works for the casinos. Beyond poker, the only way to win is by having fun. 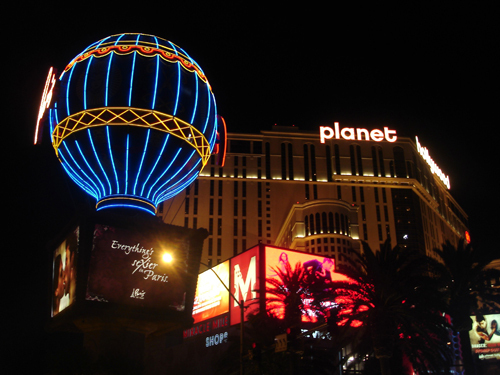 For those who like the lights and the bells and the food and the shows, Las Vegas is waiting. Just remember what the locals say: their oasis in the desert wasn’t built on winners. 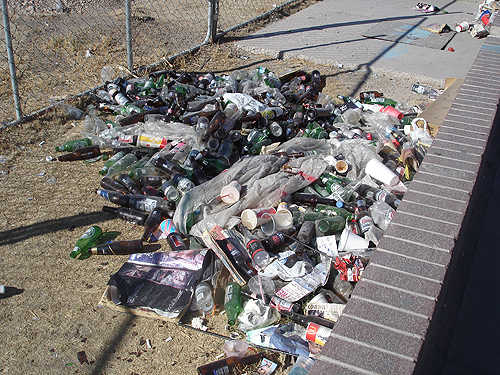 A Scene from Las Vegas Boulevard, directly across from the Wynn — perhaps the most opulent hotel/casino on the Las Vegas strip. The player makes a single bet on either black or red on each spin of the wheel (at the player’s discretion). The roulette wheel is spun 50 times per hour. The chances of losing get worse the longer a player plays. 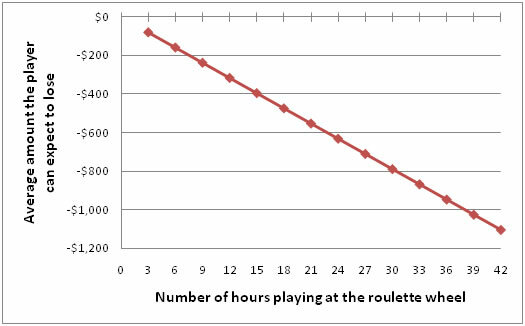 The probability of losing at roulette as a function of time is shown in the following graph. 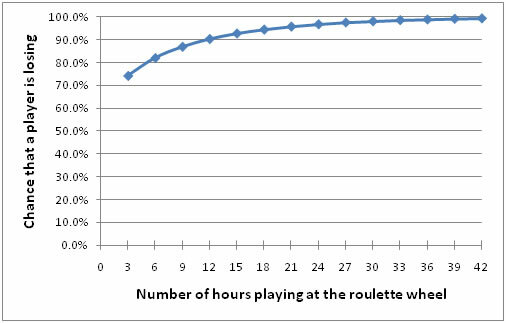 If the player wagers $10 per spin of the wheel, we can also calculate the expected loss as shown in the following graph. There’s a 50% chance the player is losing more than this average amount. The same type of analysis can be carried out no matter how the player wagers or what game is played. The specific numbers change, but not the shape of graphs. The probability of losing always approaches 100% very quickly. It’s possible to turn the odds in favor of the player at the game blackjack through the practice of card counting (see http://www.uh.edu/engines/epi2365.htm, Blackjack). For brevity, we don’t consider this possibility in the present essay. Photos by E. A. Boyd. The Engines of Our Ingenuity is Copyright © 1988-2008 by John H. Lienhard.